Coming in the next 30 days, so if you’ve preordered, make sure funds are available now. If you haven’t but want it, you’re not likely to have a better chance to get on the wait list. Bumblebee here is 10 inches high, sits on a Sector 7 base, has sensor-activated light-up eyes, and sports a removable face plate to shift to his battle mask mode. If you’re anything like me, you totally missed the fact that Sideshow Collectibles is distributing Transformers movie products from Popbox Collectibles. Keep in mind that I’m the guy who at San Diego Comic-Con asked the Hasbro Transformers team if Hasbro was going to partner up with Sideshow for new high-quality TF collectible toys (based on the same question posed to Sideshow at their panel 2 days earlier – Sideshow answered with a cryptic “no comment” while Hasbro TF’s Aaron Archer passed the buck, saying it’s not something they’d know about as it wouldn’t be their department… riiight), so you’d think I’d have noticed this connection between the 2. 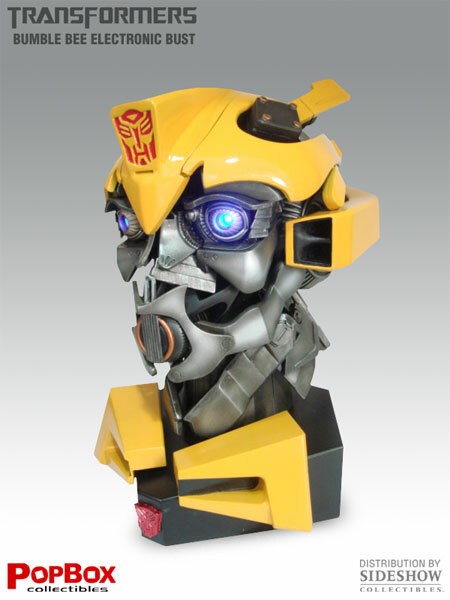 Anyway, Sideshow will be shipping this electronic Bumblebee movie bust in the next 30 days. Usually, Sideshow sends a warning notice to preordering customers 21 days in advance and then 3 days in advance of charging, but sometimes that schedule doesn’t work out quite as hoped. So if you preordered this item, now is a good time to get any ducks in a row – change cards on file with Sideshow or make sure funds are available. If you haven’t preordered it yet, the preorder limit is tapped out already but generally most items have a fair amount of preorders not come to fruition – bad cards or customers changing their minds – so Sideshow offers a wait list. Before shipping is always the best time to get on that wait list.